New research has brought us closer than ever to synthesizing entirely new forms of life. An international team of researchers has shown that artificial nucleic acids - called "XNAs" - can replicate and evolve, just like DNA and RNA. We spoke to one of the researchers who made this breakthrough, to find out how it can affect everything from genetic research to the search for alien life. The researchers, led by Philipp Holliger and Vitor Pinheiro, synthetic biologists at the Medical Research Council Laboratory of Molecular Biology in Cambridge, UK, say their findings have major implications in everything from biotherapeutics, to exobiology, to research into the origins of genetic information itself. This represents a huge breakthrough in the field of synthetic biology. The "X" Stands for "Xeno"
Every organism on Earth relies on the same genetic building blocks: the the information carried in DNA. But there is another class of genetic building block called "XNA" — a synthetic polymer that can carry the same information as DNA, but with a different assemblage of molecules. The "X" in XNA stands for "xeno." Scientists use the xeno prefix to indicate that one of the ingredients typically found in the building blocks that make up RNA and DNA has been replaced by something different from what we find in nature — something "alien," if you will. 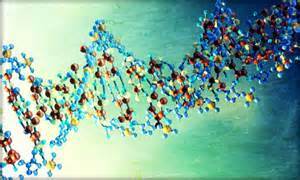 Strands of DNA and RNA are formed by stringing together long chains of molecules called nucleotides. A nucleotide is made up of three chemical components: a phosphate (labeled here in red), a five-carbon sugar group (labeled here in yellow, this can be either a deoxyribose sugar — which gives us the "D" in DNA — or a ribose sugar — hence the "R" in RNA), and one of five standard bases (adenine, guanine, cytosine, thymine or uracil, labeled in blue). The molecules that piece together to form the six XNAs investigated by Pinheiro and his colleagues (pictured here) are almost identical to those of DNA and RNA, with one exception: in XNA nucleotides, the deoxyribose and ribose sugar groups of DNA and RNA (corresponding to the middle nucleotide component, labeled yellow in the diagram above) have been replaced. Some of these replacement molecules contain four carbons atoms instead of the standard five. 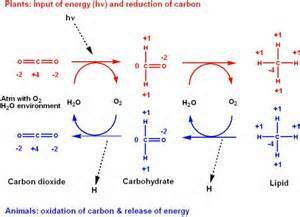 Others cram in as many as seven carbons. FANA (pictured top right) even contains a fluorine atom. 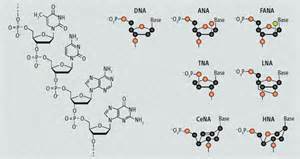 These substitutions make XNAs functionally and structurally analogous to DNA and RNA, but they also make them alien, unnatural, artificial. But scientists have been synthesizing XNA molecules for well over a decade. What makes the findings of Pinheiro and his colleagues so compelling isn't the XNA molecules themselves, it's what they've shown these alien molecules are capable of, namely: replication and evolution. "Any polymer can store information," Pinheiro tells io9. What makes DNA and RNA unique, he says, "is that the information encoded in them [in the form of genes, for example] can be accessed and copied." Information that can be copied from one genetic polymer to another can be propagated; and genetic information that can be propagated is the basis for heredity — the passage of traits from parent to offspring. In DNA and RNA, replication is facilitated by molecules called polymerases. Using a crafty genetic engineering technique called compartmentalized self-tagging (or "CST"), Pinheiro's team designed special polymerases that could not only synthesize XNA from a DNA template, but actually copy XNA back into DNA. The result was a genetic system that allowed for the replication and propagation of genetic information. A simplified analogy reveals the strengths and weaknesses of this novel genetic system: You can think of a DNA strand like a classmate's lecture notes. DNA polymerase is the pen that lets you copy these notes directly to a new sheet of paper. But let's say your friend's notes are written in the "language" of XNA. Ideally, your XNA-based genetic system would have a pen that could copy these notes directly to a new sheet of paper. What Pinheiro's team did was create two distinct classes of writing utensil — one pen that copies your friend's XNA-notes into DNA-notes, and a second pen that converts those DNA notes back into XNA-notes. "The potential for evolution is closely tied with how much information is being replicated and the error in that process," he explains. "The more error-prone… a genetic system is, the less information can be feasibly evolved." A genetic system as accurate as theirs, on the other hand, should be capable of evolution. The researchers put this claim to the test by showing that XNA strands made up of the HNA xeno-nucleotides like the one pictured here could evolve into specific sequences capable of binding target molecules (like an RNA molecule, or a protein) tightly and specifically. Researchers call this guided evolution, and they've been doing it with natural DNA for some time. The fact that it can also be accomplished in the lab with synthetic DNA indicates that such a system could, in theory, work in a living organism. "The HNA system we've developed," explains Pinheiro, is "robust enough for meaningful information to be stored, replicated and evolved." The implications of the team's findings are numerous and far-reaching. For one thing, the study sheds significant light on the origins of life itself. In the past, investigations into XNA have been largely driven by the question of whether simpler genetic systems may have existed before the emergence of RNA and DNA; the fact that these XNAs appear to be capable of evolution adds to an ever-growing body of evidence of a genetic system predating DNA and RNA both. Practical and therapeutic applications abound, as well. "The methodologies [we've developed] are a major step forward in enabling the development of nucleic acid treatments," says Pinheiro. 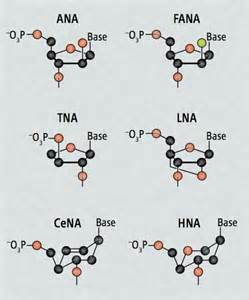 Natural nucleic acids [i.e. DNA and RNA] can be forced to evolve so that they bind tightly and specifically to specific molecular targets. The problem is that these nucleic acids are unsuitable for therapeutic use because they are rapidly broken down by enzymes called nucleases. As a result, these evolved nucleic acid treatments have a short lifespan and have a difficult time reaching their therapeutic targets. "Overall, this leads to high cost and a high failure rate for potential therapies - there is still only a single licenced [nucleic acid-based] drug on the market (Macugen)." But all six of the XNAs studied by Pinheiro and his team are stronger than regular DNA or RNA, in that they're more resistant to degradation by biological nucleases. As a result, these molecules would need little or no adaptation for therapeutic (or diagnostic) use. "Since these molecules can now be selected directly on XNA, medicinal chemistry should no longer be limiting," says Pinheiro. You could select a suitable XNA for its biocompatibility and therapeutic potential, and not worry about having it rapidly degrade inside the body. In my view, exobiology looks for life in regions it cannot physically visit. In that context, it searches for tell tale signs of life that can be remotely monitored but it has only life on Earth as examples to identify such suitable markers. Based on extant biology, DNA and RNA are good candidates for such a search. However, by showing that other nucleic acids can also store information, replicate and evolve, our research may force a rethink as to whether DNA and RNA are the most suitable tell tale signs of life. Of course, nothing would call the indispensability of DNA- or RNA-based life into question more than the generation of an entirely synthetic, alternative life form, built from the ground up entirely by XNA. Such an organism would require XNA capable of driving its own replication, without the aid of any biological molecules. Pinheiro says that's still a ways off. "Even in its simplest setup... it would be very challenging to develop an XNA system within a cell." Such a system would require XNA capable of self-replication, and capable of undergoing evolution in a self-sustained manner. That said, his team's work represents a major step in the right direction. As the molecular machinery designed to manipulate XNAs grows, so, too, will the capacity for synthetic genetic systems to stand and operate on their own. The researchers' findings are published in today's issue of Science. One wonders if we'll ever come across creatures in the universe that evolved and emerged from XNA naturally. Life on earth only uses about 20 amino acids but there are many others so to stands to life elsewhere in the universe might be working in proteins based on a largely different set of amino acids. There's a growing body of evidence that suggests TNA (one of the six XNAs examined by Pinheiro's team) may have been a simple, four-carbon-sugar (threose) precursor to RNA. Alasdair did a good writeup on it a couple of months ago (the ASU researcher Alasdair quotes was a co-author on this latest study, as well). By swapping sugars in the DNA helix, scientists have created a new kind of genetic code that can function and evolve like regular DNA. Every living thing on Earth uses DNA or RNA to carry its genetic instructions for life. These two nucleic acids have different names because they're built from different sugars: DNA uses deoxyribose sugars for a backbone of its double helix, while RNA uses ribose. But what if other sugars could be used too? Now scientists have shown that at least six other types of sugars can form nucleic acid backbones—and they can be used to store and retrieve genetic information . The researchers built DNA molecules from scratch, but replaced the deoxyribose with six other kinds of sugar, including hexitol, threose, and arabinose. The six types of synthetic genetic chains are called XNAs, or xeno-nucleic acids ("xeno" is Greek for "foreign"[F1] ). And because XNA shows the possibility of heredity—passing down their genetic information—the researchers say these molecules not only could address fascinating questions about the origin of life, but also could open up the possibility of another kind of life based not on DNA and RNA[F2] . --Jack Szostak, a geneticist and Nobel laureate at Harvard University, tells PM in an email that the work "is very interesting with respect to the origin of life—in principle, many different polymers could serve the roles of RNA and DNA in living organisms. 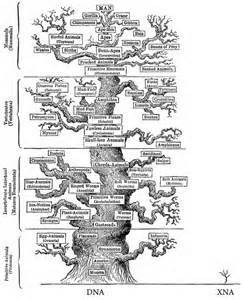 Why then does modern biology use only RNA and DNA?" This isn't the first time that geneticists have cooked up synthetic nucleic acids in a lab. Some scientists had previously created DNA with new kinds of base pairs beyond the A-T and C-G connections in DNA, and others had already created XNAs that incorporate foreign sugars. John Chaput, a molecular biologist at Arizona State University and an author on the new study in Science, says this work asks a new question: "How can you perform Darwinian evolution on something other than DNA or RNA? Lots of DNA and RNA molecules have been evolved in the laboratory, but going the next step and doing it on other molecules has been very challenging. This is one of the first examples of that." --To prove that XNAs could evolve, the researchers first had to create a new kind of enzyme to build the XNAs. Although it's possible to manufacture XNAs by machine, the resulting nucleic acids are short chains that have limited functionality and evolvability. So instead of using the machinated approach, the researchers took thousands of DNA-building enzymes and evolved them into XNA-building enzymes.--That required taking thousands of enzymes and mixing them together with XNA building blocks, as well as DNA strands that served as templates for the scaffolding on which to build XNA molecules[F3] . If an enzyme turned out to be good at building XNA strands, it was captured using a filtering process and amplified it for the next round of testing; enzymes that were bad at making XNA were washed away. Over many rounds of filtering, the enzyme population evolved to become more adroit at building XNAs—in fact, they could produce polymers XNA chains that lasted were five times longer than machine-made XNAs. "They took enzymes that already existed, and evolved mutants of them that are better at making XNAs," says Floyd Romesberg, a chemist at the Scripps Research Institute, who called the technique "impressive." --Next, the researchers tried to evolve the XNAs themselves. To do so, they used a similar filtering technique. In this case, the scientists selected for XNAs that could bind to a specific protein; XNAs that did not bind to the proteins were washed away. Those that did bind were transcribed back into DNA so that they could be replicated. After replication, the team transcribed the copies back into XNA. In this way, the XNAs that had evolved to bind the protein were able to pass on that talent to a new generation of XNAs[F4] . Because the XNAs are able to pass genetic information from one generation to the next and can adapt to the constraints of test tube evolution, Chaput says, XNAs could serve as the building blocks for completely new genetic systems. [F5] "Could you create synthetic life with it? That's possible,[F6] but it's much further down the road. "-Szostak agrees, saying that "in the longer run, a very interesting implication is that it may be possible to design and build new forms of life that are based on one or more of these non-natural genetic polymers." But Romesberg emphasized that creating completely new life forms using XNA would be a long and difficult mission. The foremost challenge: Researchers must find an efficient way to reproduce XNAs directly into more XNAs without having to convert them to DNA and back again.---Some folks are nervous that releasing XNA into the biosphere could allow it to intermingle with DNA and RNA with unpredictable results[F7] . But scientists such as Steven Benner and Markus Schmidt retort that XNAs are foreign enough to be invisible to natural organisms (read more about this issue here).--Regardless of whether XNAs can or will be used to create new life forms, the researchers have shown that it is possible to expand evolution into systems based not on DNA or RNA. And the XNAs and their enzymes may also lead to some answers about why life as we know it is based on those to molecules only. Are DNA and RNA the best molecules to store genetic information and catalyze biological reactions, or did they become the building blocks of life by sheer happenstance? Now researchers will have the tools to test the true efficiency against lab-created competitors.--Medicine, too, could benefit from XNAs, Romesberg says. Doctors already prescribe biological products such as enzymes and antibodies to treat certain diseases, but these drugs break down quickly in the stomach and the blood stream. Because XNAs are somewhat foreign, they're not broken down as quickly in the body, as it has not evolved enzymes to digest them. [F8] --The experiment also has implications for looking for life on other planets. "Maybe if you look hard enough out in space, you might find a life form based on XNA," Chaput says. 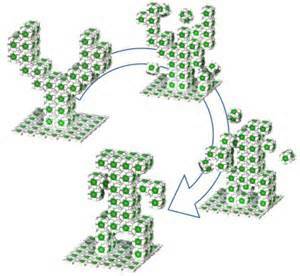 Towards XNA nanotechnology- new materials from synthetic genetic polymers. Nucleic acids display remarkable properties beyond information storage and propagation. The well-understood base pairing rules have enabled nucleic acids to be assembled into nanostructures of ever increasing complexity. Although nanostructures can be constructed using other building blocks, including peptides and lipids, it is the capacity to evolve that sets nucleic acids apart from all other nanoscale building materials. Nonetheless, the poor chemical and biological stability of DNA and RNA constrain their applications. Recent advances in nucleic acid chemistry and polymerase engineering enable the synthesis, replication, and evolution of a range of synthetic genetic polymers (XNAs) with improved chemical and biological stability. We discuss the impact of this technology on the generation of XNA ligands, enzymes, and nanostructures with tailor-made chemistry. Synthetic genetic polymers capable of heredity and evolution. Pinheiro VB1, Taylor AI, Cozens C, Abramov M, Renders M, Zhang S, Chaput JC, Wengel J, Peak-Chew SY, McLaughlin SH, Herdewijn P, Holliger P.
The European Commission has supported the Integrated Project PACE in its Future Emerging Technologies program from 2004-2008. This is the final public report of results and experience in PACE.---PACE has created the foundation for a new generation of embedded IT using programmable chemical systems that approach artificial cells in their properties of self-repair, self-assembly, self-reproduction and evolvability. Future projects will build on the technology and experience developed in PACE to build the first artificial chemical cells and apply them to revolutionize complex construction in and outside IT. PACE has established a new hybrid IT technology for programming complex chemical systems. PACE has explored the IT potential of future synthetic chemical cells: addressing both the novel embedded IT required to produce and program them and their technical opportunities, both within IT and to other fields. In contrast with biological approaches to minimize existing cells, applications of these artificial chemical cells will exploit their chemical distinctiveness from biological cells, in particular their ability to function without proteins and below the complexity barrier posed by biological translation machinery.--A consortium of some 13 partners and 2 cooperating groups from 8 European countries, including Switzerland and Lithuania, and several leading USA organizations are pioneering this new approach under the IST-FET section of the EU 6th Framework Program (FP6). Now scientists have shown that at least six other types of sugars can form nucleic acid backbones—and they can be used to store and retrieve genetic information . The researchers built DNA molecules from scratch, but replaced the deoxyribose with six other kinds of sugar, including hexitol, threose, and arabinose. The six types of synthetic genetic chains are called XNAs, or xeno-nucleic acids ("xeno" is Greek for "foreign"[F9] ). And because XNA shows the possibility of heredity—passing down their genetic information—the researchers say these molecules not only could address fascinating questions about the origin of life, but also could open up the possibility of another kind of life based not on DNA and RNA[F10] . --Jack Szostak, a geneticist and Nobel laureate at Harvard University, tells PM in an email that the work "is very interesting with respect to the origin of life—in principle, many different polymers could serve the roles of RNA and DNA in living organisms. 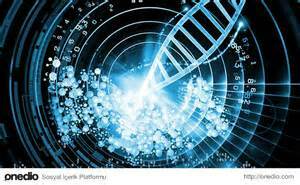 Why then does modern biology use only RNA and DNA?" This isn't the first time that geneticists have cooked up synthetic nucleic acids in a lab. Some scientists had previously created DNA with new kinds of base pairs beyond the A-T and C-G connections in DNA, and others had already created XNAs that incorporate foreign sugars. John Chaput, a molecular biologist at Arizona State University and an author on the new study in Science, says this work asks a new question: "How can you perform Darwinian evolution on something other than DNA or RNA? Lots of DNA and RNA molecules have been evolved in the laboratory, but going the next step and doing it on other molecules has been very challenging. This is one of the first examples of that." 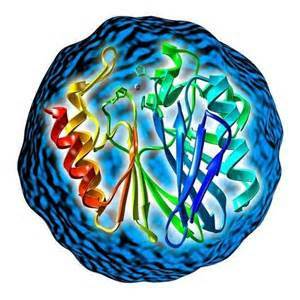 --To prove that XNAs could evolve, the researchers first had to create a new kind of enzyme to build the XNAs. Although it's possible to manufacture XNAs by machine, the resulting nucleic acids are short chains that have limited functionality and evolvability. So instead of using the machinated approach, the researchers took thousands of DNA-building enzymes and evolved them into XNA-building enzymes.--That required taking thousands of enzymes and mixing them together with XNA building blocks, as well as DNA strands that served as templates for the scaffolding on which to build XNA molecules[F11] . If an enzyme turned out to be good at building XNA strands, it was captured using a filtering process and amplified it for the next round of testing; enzymes that were bad at making XNA were washed away. Over many rounds of filtering, the enzyme population evolved to become more adroit at building XNAs—in fact, they could produce polymers XNA chains that lasted were five times longer than machine-made XNAs. "They took enzymes that already existed, and evolved mutants of them that are better at making XNAs," says Floyd Romesberg, a chemist at the Scripps Research Institute, who called the technique "impressive." --Next, the researchers tried to evolve the XNAs themselves. To do so, they used a similar filtering technique. In this case, the scientists selected for XNAs that could bind to a specific protein; XNAs that did not bind to the proteins were washed away. 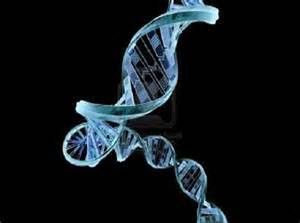 Those that did bind were transcribed back into DNA so that they could be replicated. After replication, the team transcribed the copies back into XNA. In this way, the XNAs that had evolved to bind the protein were able to pass on that talent to a new generation of XNAs[F12] . Because the XNAs are able to pass genetic information from one generation to the next and can adapt to the constraints of test tube evolution, Chaput says, XNAs could serve as the building blocks for completely new genetic systems. [F13] "Could you create synthetic life with it? That's possible,[F14] but it's much further down the road. "-Szostak agrees, saying that "in the longer run, a very interesting implication is that it may be possible to design and build new forms of life that are based on one or more of these non-natural genetic polymers." But Romesberg emphasized that creating completely new life forms using XNA would be a long and difficult mission. The foremost challenge: Researchers must find an efficient way to reproduce XNAs directly into more XNAs without having to convert them to DNA and back again.---Some folks are nervous that releasing XNA into the biosphere could allow it to intermingle with DNA and RNA with unpredictable results[F15] . But scientists such as Steven Benner and Markus Schmidt retort that XNAs are foreign enough to be invisible to natural organisms (read more about this issue here).--Regardless of whether XNAs can or will be used to create new life forms, the researchers have shown that it is possible to expand evolution into systems based not on DNA or RNA. And the XNAs and their enzymes may also lead to some answers about why life as we know it is based on those to molecules only. Are DNA and RNA the best molecules to store genetic information and catalyze biological reactions, or did they become the building blocks of life by sheer happenstance? Now researchers will have the tools to test the true efficiency against lab-created competitors.--Medicine, too, could benefit from XNAs, Romesberg says. Doctors already prescribe biological products such as enzymes and antibodies to treat certain diseases, but these drugs break down quickly in the stomach and the blood stream. Because XNAs are somewhat foreign, they're not broken down as quickly in the body, as it has not evolved enzymes to digest them. [F16] --The experiment also has implications for looking for life on other planets. "Maybe if you look hard enough out in space, you might find a life form based on XNA," Chaput says. Xeno nucleic acid (XNA) is a synthetic alternative to the natural nucleic acids DNA and RNA as information-storing biopolymers that differs in the sugar backbone. As of 2011, at least six types of synthetic sugars have been shown to form nucleic acid backbones that can store and retrieve genetic information. 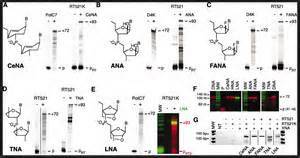 Research is now being done to create synthetic polymerases to transform XNA. The study of its production and application has created a field known as xenobiology.--Although the genetic information is still stored in the four canonical base pairs (unlike other nucleic acid analogues), natural DNA polymerases cannot read and duplicate this information. Thus the genetic information stored in XNA is “invisible” and therefore useless to natural DNA-based organisms. Alex Taylor --A team of researchers have created the world’s first enzymes made from artificial genetic material.-The synthetic enzymes, which are made from molecules that do not occur anywhere in nature, are capable of triggering chemical reactions in the lab.--The research is published in the journal Nature and promises to offer new insights into the origins of life, as well as providing a potential starting point for an entirely new generation of drugs and diagnostics. [F17] In addition, the authors speculate that the study increases the range of planets that could potentially host life.--All life on Earth depends on the chemical transformations that enable cellular function and the performance of basic tasks, from digesting food to making DNA. These are powered by naturally-occurring enzymes which operate as catalysts, kick-starting the process and enabling such reactions to happen at the necessary rate.--For the first time, however, the research shows that these natural biomolecules may not be the only option, and that artificial enzymes could also be used to power the reactions that enable life to occur.--The findings build on previous work in which the scientists, from the MRC Laboratory of Molecular Biology in Cambridge and the University of Cambridge, created synthetic molecules called “XNAs”. These are entirely artificial genetic systems that can store and pass on genetic information in a manner similar to DNA. The world’s first enzymes made from artificial genetic material have been created by scientists in what could be a major step towards generating synthetic life.-The enzymes, which do not occur naturally, were created using a synthetic form of DNA called XNA and were capable of triggering chemical reactions in the lab.-The findings build on previous work that showed six types of XNA molecules were capable of storing and transmitting genetic information in the same way as DNA and RNA.-It had been previously thought that DNA and RNA, which form the basis for all life on Earth, were the only way of storing genetic material.-But now the latest research by synthetic biologists in Cambridge shows that this synthetic genetic material is also capable of performing another crucial biological role - catalysing biochemical reactions that are essential for life.-Using their lab-made XNAs as building blocks, the team were able to create synthetic enzymes, which they have named ‘XNAzymes’, that could cut up and stitch together small chunks of genetic material, just like naturally occurring enzymes.-The suggests that such molecules could be used to replicate some of the earliest steps needed to produce life itself and may even provide clues about what life on other planets may be like.-It is thought that life first began with the evolution of a segment of RNA that was able to copy itself and catalyse reactions. If XNA is also capable of this, then it could also have led to different forms of life on other planets or could be used to create new synthetic forms of life. However, Dr Philipp Holliger, who led the research at the MRC Laboratory of Molecular Biology in Cambridge, said: ‘Our work suggests that, in principle, there are a number of possible alternatives to nature's molecules that will support the catalytic processes required for life.-‘Until recently, it was thought that DNA and RNA were the only molecules that could store genetic information and, together with proteins, the only biomolecules able to form enzymes.-‘Life's 'choice' of RNA and DNA may just be an accident of prehistoric chemistry.--'The creation of synthetic DNA, and now enzymes, from building blocks that don't exist in nature also raises the possibility that if there is life on other planets it may have sprung up from an entirely different set of molecules, and widens the possible number of planets that might be able to host life.’-In 2012 Dr Holliger’s group showed that there were six alternative molecules to the oligonucleotides that form RNA and DNA, which they called XNAs.--They demonstrated that these could store information and could even evolve through natural[F21] selection.-In their latest research, which is published in the journal Nature, the team created four different types of synthetic enzyme from strands of XNA.--These XNAzymes were able to perform the role of a polymerase - an enzyme that cuts and joins RNA strands together - in a test tube. One of the XNAzymes they created was also able to join XNA strands together to form longer molecules - a key step towards creating a living system that can replicate itself.--[F22] Although it will still be some time before these can be used to create living synthetic organisms, Dr Holliger believes that XNAzymes could also be useful for developing new therapies for range of diseases including cancers and some viral infections. [F23] -Dr Holliger added: ‘Our XNAs are chemically extremely robust and, because they do not occur in nature, they are not recognised by the body's natural degrading enzymes.-[F24] ‘This might make them an attractive candidate for long-lasting treatments that can disrupt disease-related RNAs.’Professor Patrick Maxwell, chair of the MRC's Molecular and Cellular Medicine Board, said the work could kick start an entirely new branch of medicine. Enzymes that don't exist in nature have been made from genetic material that doesn't exist in nature either, called XNA, or xeno nucleic acid.--It's the first time this has been done and the results reinforce the possibility that life could evolve without DNA or RNA, the two self-replicating molecules considered indispensible for life on Earth.--"Our work with XNA shows that there's no fundamental imperative for RNA and DNA to be prerequisites for life," says Philipp Holliger of the Laboratory of Molecular Biology in Cambridge, UK, the same laboratory where the structure of DNA was discovered in 1953 by Francis Crick and James Watson. Holliger's team has made XNAs before. Their unnatural XNA contains the same bases – adenine, thymine, guanine, cytosine and uracil – on which DNA and RNA rely for coding hereditary information. What's different is the sugar to which each base is attached.--In DNA and RNA, the sugars are deoxyribose and ribose, respectively. Holliger made new types of genetic material by replacing these with different sugars or other molecules.--Now, they have taken a step closer to mimicking early life on the planet by showing that XNAs can also serve as enzymes – indispensible catalysts for speeding up chemical reactions vital for life.--One of the first steps towards life on Earth is thought to be the evolution of RNA into self-copying enzymes. So by showing that XNAs can act as enzymes, on top of being able to store hereditary information, Holliger has recreated a second major step towards life.--The XNA enzymes can't yet copy themselves but they can cut and paste RNA, just like natural enzymes do, and even paste together fragments of XNA.--It's the first demonstration that, like prehistoric RNA, XNA can catalyse reactions on itself, even if it can't yet copy itself as RNA can.--Holliger argues that RNA and DNA may have come to dominate Earth by chance, simply because they were the best evolutionary materials to hand. "You could speculate that on other planets, XNAs would dominate instead," he says. "This work is another nice step towards demonstrating the functional capabilities of XNAs," says Nobel prizewinner Jack Szostak of Harvard University, who studies the origins of life on Earth .--"The possibility that life elsewhere, on exoplanets, could have started with something other than RNA or DNA is quite interesting, but the primordial biopolymer for any form of life must satisfy other constraints as well, such as being something that can be generated by prebiotic chemistry and replicated efficiently," Szostak says. "Whether XNA can satisfy these constraints, as well as providing useful functions, remains an open question." Holliger says that XNAs may also have roles to play in medicine. Because they do not occur naturally, they can't be broken down in the human body. And since they can be designed to break and destroy RNA, they could work as drugs for treating RNA viruses or disabling RNA messages that trigger cancers.-"We've made XNA enzymes that cut RNA at specific sites, so you could make therapies for cleaving viral or oncogenic messenger RNA[F26] ," says Holliger. "And because they can't be degraded, they could give long-lasting protection." Scientists have made the first artificial chromosome which is both complete and functional in a milestone development in synthetic biology, which promises to revolutionise medical and industrial biotechnology in the coming century.--The researchers built the artificial chromosome[F27] from scratch by stitching synthetic strands of DNA together in a sequence based on the known genome of brewer’s yeast. 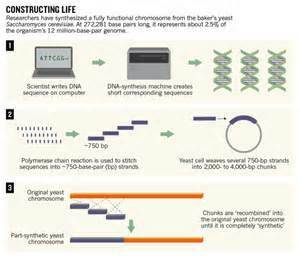 They predict that a completely synthetic yeast genome comprised of its entire complement of 16 chromosomes could be made within four years.-“Our research moves the needle in synthetic biology from theory to reality. This work represents the biggest step yet in an international effort to construct the full genome of synthetic yeast,” said Jef Boeke of the New York University School of Medicine, a lead author of the study published in the journal Science.-“It is the most extensively altered chromosome ever built. But the milestone that really counts is integrating it into a living yeast cell. We have shown that yeast cells carrying this synthetic chromosome are remarkably normal,” [F28] Dr Boeke said.--“They behave almost identically to wild yeast cells, only they now possess new capabilities and can do things that wild yeast cannot [do],” he said.--“Not only can we make designer changes on a computer, but we can make hundreds of changes through a chromosome and we can put that chromosome into yeast and have a yeast that looks, smells and behaves like a regular yeast, but this yeast is endowed with special properties that normal yeasts don’t have,[F29] ” he explained.--The synthetic yeast chromosome was based on chromosome number 3, but scientists deleted large parts of it that were considered redundant and introduced further subtle changes to its sequence – yet the chromosome still functioned normally and replicated itself in living yeast cells, they said.--“We took tiny snippets of synthetic DNA and fused them together in a complex series of steps to build an essentially computer-designed chromosome 3, one of the 16 chromosomes of yeast. We call it ‘synIII’ because it’s a completely synthetic derivative that has been engineered in a variety of interesting ways to make it different from the normal chromosome,” Dr Boeke said.--The achievement was compared to climbing Mount Everest in its labour-intensive complexity, as it involved stitching together 273,871 individual building blocks of DNA – the nucleotide bases of the yeast’s genes – in the right order, and removing about 50,000 repeating sequences of the chromosome that were considered redundant.--“When you change the genome you’re gambling. One wrong change can kill the cell. We have made over 50,000 changes to the DNA code in the chromosome and our yeast still lived. That is remarkable, it shows that our synthetic chromosome is hardy, and it endows the yeast with new properties,” Dr Boeke said.--Britain is one of several countries involved in the international effort to synthesise all 16 yeast chromosomes. Last year, the Government announced that it will spend £1 million on the yeast project out of a total budget of £60 million it has dedicated to synthetic biology.--Paul Freemont of Imperial College London said that the first complete and functional synthetic yeast chromosome is “a big deal” and significant step forward from the work by DNA scientist Craig Venter, who synthesised the much simpler genome of a bacterium in 2010.--“It opens up a whole new way of thinking about chromosome and genome engineering as it provides a proof of concept that complicated chromosomes can be redesigned, synthesised and made to work in a living cell,” Dr Freemont said.--Artificial chromosomes designed by computer will be vital for the synthetic life-forms that scientists hope to design for a range of applications, such as the breakdown of persistent pollutants in the environment or the industrial manufacture of new kinds of drugs and vaccines for human and animal medicine.--“It could have a lot of practical applications because yeast is used in the biotechnology industry to produce everything from alcohol, which has been produced for centuries, to biofuels and speciality chemicals to nutrients,” Dr Boeke said.--“Yeast is a really interesting microorganism to work on because it has an ancient industrial relationship with man. We’ve domesticated it since the days of the Fertile Crescent and we’ve had this fantastic collaboration to make wine, break and beer,” he said.--“That relationship persists today in a wide range of products that are made with yeast such as vaccines, fuels and specialty chemicals and it’s only going to be growing. Yeast is one of the few microbes that packages its genetic material in a nucleus just like human cells. So it serves as a better model for how human cells work in health and disease,” Dr Boeke added. Scientists made a substantial breakthrough in understanding how to alter the fundamental nature of life, and they did so by creating for the first time a partially artificial life form that passes along lab-engineered DNA. --The work, published online in the journal Nature on Wednesday, came from the Scripps Research Institute in La Jolla, Calif., and centered around a modified strain of E. coli bacterium that was fused with chemically synthesized nucleotides and was able to replicate its natural and synthetic components during reproduction[F30] . -Throughout the entire history of life on Earth, the genetic code of all organisms has been uniform, from the simplest of bacteria all the way up to human beings, meaning our genetic code is composed of the same four nucleotides labeled A, C, T, and G. Those nucleotides join to form base pairs, which are used in the creation of genes that cells use to produce proteins. --Researchers at Scripps created two new nucleotides, X and Y, and fused them into the E. coli bacterium. The organism was able to reproduce normally with six -- instead of the standard four -- nucleotides, meaning it genetically passed along the first combination of manmade and natural DNA. -"This has very important implications for our understanding of life," Floyd Romesberg, who headed the Scripps researcher team, told The New York Times. "For so long people have thought that DNA was the way it was because it had to be, that it was somehow the perfect molecule." --Because this breakthrough could impact more than just biological research, the field -- called synthetic biology -- is likely to be met with harsh criticism from those who fear that tampering with the building blocks of existence could be a step too far for science. The subset of synthetic biology focusing on creations unfamiliar to nature with expanded genetic alphabets is sometimes referred to as xenobiology. --"The arrival of this unprecedented 'alien' life form [F31] could in time have far-reaching ethical, legal and regulatory implications," Jim Thomas of the ETC Group, a Canadian advocacy organization, told The New York Times. "While synthetic biologists invent new ways to monkey with the fundamentals of life, governments haven't even been able to cobble together the basics of oversight, assessment or regulation for this surging field. "[F32] -To create a modified organism that would reproduce, Romesberg's team had to first create stable enough artificial nucleotides. The creation of X and Y variants came only after 300 types were tried. The X nucleotide pairs with the Y, just as A does with T and C with G in natural DNA. It's unclear whether a semi-artificial organism could sustain a far more expansive genetic code, meaning many more synethic pairs, and if there is any time-based restraint involved.-As far as worrying about never-before-seen strains of bacteria escaping into the wild, Romesberg stressed that this newly created organism could never infect anything[F33] . To continue reproducing the synthetic nucleotides, the researchers had to feed the necessary chemicals to the bacterium or else it would stop producing the X and Y pair. P--Romesberg and his colleagues' findings follow decades of work in synthetic biology, and the results have long since left the confines of academic research. Romesberg's company, Synthorx, is trying to design an administering technique for viruses that would rely on the artificial life forms' inability to reproduce the synthetic nucleotides without the proper chemicals, meaning they could be used to create an immune system response while be inhibited from spreading. Beyond those immediate applications, the next steps are figuring out if the synthesized nucleotides can be fused into the RNA of living organisms and used to produce new proteins, as well as discovering whether or not genetically engineered cells could be used to help organisms reproduce those synthetic nucleotides on their own. [F18]So are they from the space station up in orbit—are they from some parallel-or are they even alien? It is a thought provoker~where ? [F21]Imagine that New XNA that could evolve through Natural Selection---what happens to DNA?? [F22]Excite me Already---creating life with a XNA no one knows really anything about---and does XNA produce a X-MAN or X-WOMAN!! !